The signatures of both the donor and attorney should be witnessed, a witness can be anyone as long as he is not related to you. You can use this document for almost any situation - whether you are going to Africa to help prevent conflict diamond mining, flying to the moon, or going deep sea dives. It is useful because of its flexibility - you choose the what, how, where, when and who. Financial organisations such as banks have their own internal procedures and requirements. We advise you to be aware of any such requirements before using this document. Note: This document is not suitable for an elderly person or someone with mental problems. 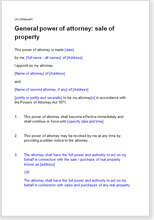 In that situation you do need an enduring power of attorney which you could download freely from Govt site.